METAYEG BOTCHED UP "AS USUAL"
there are very many problems with cheap mezuzos/parshiyos, one of them that the sofer doesn't waste his time doing the tagim [IE doing Hashems mitzva!] he gives it to a metayeg (another person that only adds the tagim. Sometimes "metayeg" is a cover-up for the sofer himself. First he writes the mezuzos and after finishing many, before he releases them to the socher, sits quickly to metayeg them). This metayeg [usualy] doesn't have a csav kabala, didn't learn or know the laws of stam. NOTHING!! 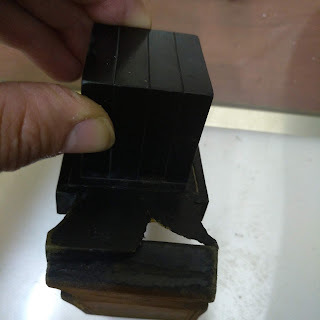 There are many cheap sofrim that give parshiyos, or sefer tora to metaygim - this causes that many letters are left without tagim. Here is a common problem the metayeg causes without even understanding what he is doing!!?? I have added lower a more accurate picture of the zayin in mezuzuot. The metayeg adding tagim blotched up! added a whole head to the zayin causing the zayin's head to be more than the foot of the letter. I am sure neither the sofer or metayeg even know that there is a problem. This is the problem Eli noted in the "pen" - I have cut it out of his post. The metayeg added tagim to the head of the nun causing the head to become very thick - turning into a kosher zayin. Please measure!! Here is another example from Dovid's posts above. The metayeg adding tagim to the rosh of the nun, that is a small rosh, and since the nun was already dry the tagim didn't stick well so he had to play around - and the results are clear! These are only one aspect of the problem named "metayeg". But at least as an 'erlicher yid' when you see this phenomena, you should know that you are dealing with cheap stuff, cheap hallachicly!! Is the zain in the first picture shelo kisidran? 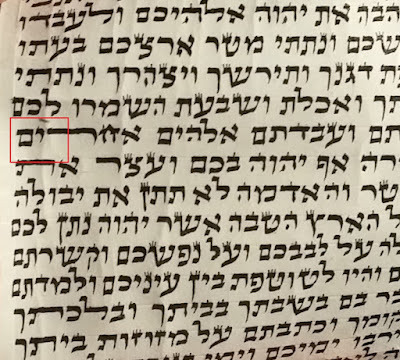 bshaas hadchak one may rely on some poskim that allow fixing the length of the regel in this case (IE when there is a MOK in the measure of the standard csav, although not to the specific letter in case). but this is bdieved sh'bdieved (since according hallacha this zayin is realy lacking shiyur mlo OK in its foot, when we measure it in regard to its head). Can this Beshas hadchak svara leheter (going after the regel in comparison to the measure of the standard ksav although not to the specific letter in case)also work with a thick rosh for a nun sofit, to save it from being gniza? I dont think so, since in the nun sofit it is actualy a kosher zayin. 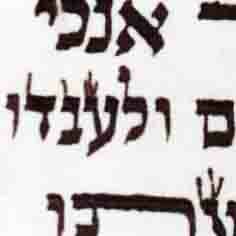 Once there is a definite shinuy tzura of one letter [in this case to another letter] it is mamash shlo csidran.